The US Energy Information Association - EIA - is out today with the Short Term Energy Outlook report with projections for 2019 & 2020. 2019 Price forecast for Crude oil - $61/bbl Brent, $53-57/bbl WTI. The Brent average for 2018 was $71/bbl, so we are expecting to continue to downward overall trend in pricing. US Crude Production hit a high in 2018 - it is expected to continue to accelerate from the current level through 2019 & 2020. 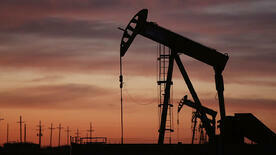 Over the next 2 years, experts expect an increase of over 1.5 million barrels per day. US (Dry) Natural Gas production is expected to jump from 83 bcf per day in 2018 to 90 in 2019. Global Inventories are expected to continue to increase. On the clean energy front, coal's role in electrical production continues to decline over the next 2 years. Hydropower's share of generation is projected to remain stable. Wind power electrical generation is expected to outpace hydropower for the first time ever in 2019. Carbon emissions are projected to decline 1.2% in 2019 as well, and a little under 1% for 2020 as it stands now. Long story short - expect more production, more inventory, lower prices, continued progress and growth on cleaner energy and a decline in carbon emissions - all at the same time. Happy 2019!